According to Hubspot, companies that nurture leads make 50% more sales at a cost 33% less than non-nurtured. If you spent several years in B2B marketing, you've undoubtedly heard for life about the benefits of lead nurturing. Building trust and relationship with your audience. Accelerating sales pipeline. Increasing average deal ... Más informaciones value. "get the contact and send the valuable content." This is the exact reason why so miserable amount of companies has an effective lead nurturing in place. According to the same stats from Hubspot 65% of B2B marketers have not even established lead nurturing. The problem is if you'd like to learn more, you won't find any good content besides essential guides from Marketo and Hubspot. 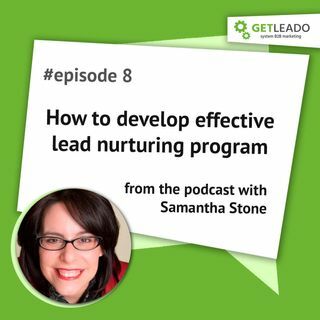 That's why invited Samantha Stone to talk about the step by step approach how to establish an effective lead nurturing program. 1. Segment all your leads by their job role and group them by the stage of customer journey they are now. 2. Audit all the content you've already (blogs, webinars, knowledge database, etc.) and identify priority gaps. * What are the right steps to plan and set up lead nurturing program? * What pitfalls you should avoid? * How to align the lead nurturing program with the buyer’s journey? * How to define what content to send on every stage of lead nurturing? * How to figure out the proper length of lead nurturing? * How you can describe lead scoring? Is it necessary to apply it to lead nurturing program? What is the right way to apply it? * The most common question about lead nurturing I get is how to measure the efficiency of lead nurturing. What are the right metrics to track? * What tools do you use or can recommend for setting up the lead nurturing campaign?